Local Administrator Password Solution (LAPS) from Microsoft simplifies password management by allowing organizations to use Active Directory (AD) to store unique passwords for computers. Typically, an organization might reuse the same local administrator password across the computers in an AD domain. However, this approach represents a security risk because it can be exploited during lateral escalation attacks. LAPS solves this problem by creating unique, randomized passwords for the Administrator account on each computer and storing it encrypted in AD. Install the LAPS binaries on instances joined to your AWS Microsoft AD domain. The binaries add additional client-side extension (CSE) functionality to the Group Policy client. Extend the AWS Microsoft AD schema. 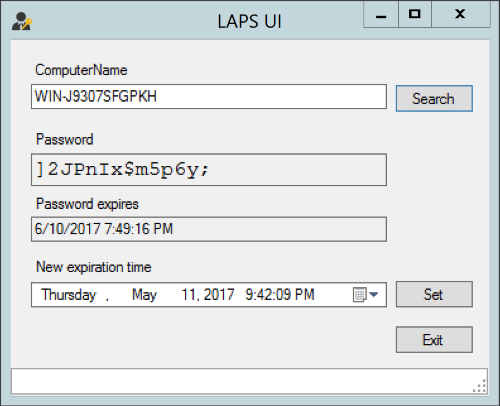 LAPS requires new AD attributes to store a password and its expiration time. Configure AD permissions and delegate the ability to retrieve the local administrator password for IT staff in your organization. 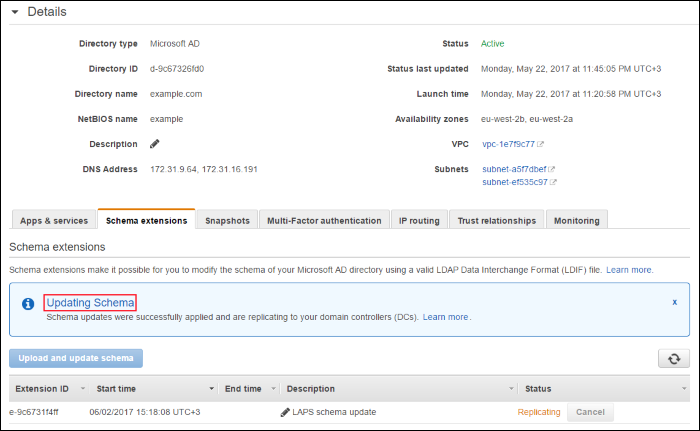 Configure Group Policy on instances joined to your AWS Microsoft AD domain to enable LAPS. This configures the Group Policy client to process LAPS settings and uses the binaries installed in Step 1. The following diagram illustrates the setup that I will be using throughout this post and the associated tasks to set up LAPS. Note that the AWS Directory Service directory is deployed across multiple Availability Zones, and monitoring automatically detects and replaces domain controllers that fail. In this blog post, I explain the prerequisites to set up Local Administrator Password Solution, demonstrate the steps involved to update the AD schema on your AWS Microsoft AD domain, show how to delegate permissions to IT staff and configure LAPS via Group Policy, and demonstrate how to retrieve the password using the graphical user interface or with Windows PowerShell. This post assumes you are familiar with Lightweight Directory Access Protocol Data Interchange Format (LDIF) files and AWS Microsoft AD. If you need more of an introduction to Directory Service and AWS Microsoft AD, see How to Move More Custom Applications to the AWS Cloud with AWS Directory Service, which introduces working with schema changes in AWS Microsoft AD. In order to implement LAPS, you must use AWS Directory Service for Microsoft Active Directory (Enterprise Edition), also known as AWS Microsoft AD. Any instance on which you want to configure LAPS must be joined to your AWS Microsoft AD domain. You also need a Management instance on which you install the LAPS management tools. In this post, I use an AWS Microsoft AD domain called example.com that I have launched in the EU (London) region. To see which the regions in which Directory Service is available, see AWS Regions and Endpoints. Use the Amazon EC2 Systems Manager (SSM) domain join feature. 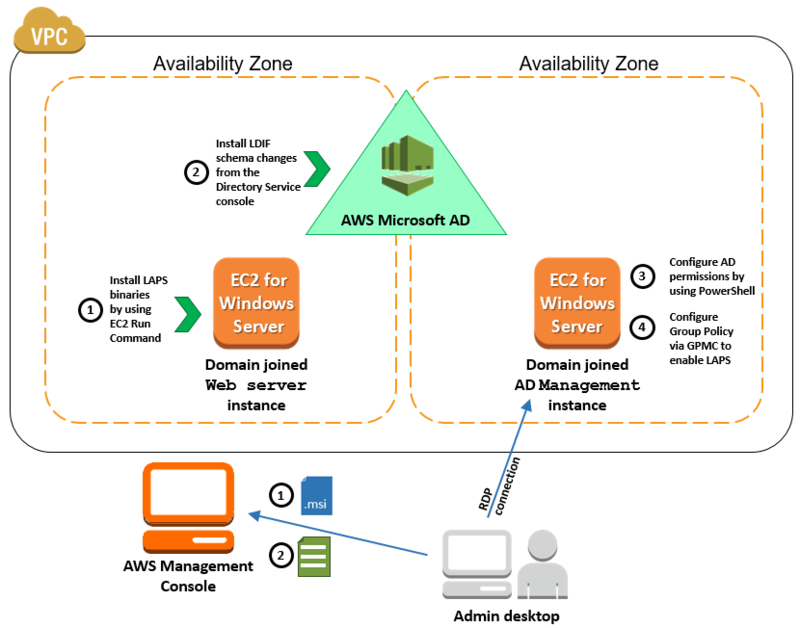 To learn more about how to set up domain join for EC2 instances, see joining a Windows Instance to an AWS Directory Service Domain. Manually configure the DNS server addresses in the Internet Protocol version 4 (TCP/IPv4) settings of the network card to use the AWS Microsoft AD DNS addresses (172.31.9.64 and 172.31.16.191, for this blog post) and perform a manual domain join. A Management instance on which I will install the management tools that I have tagged as Management. A Web Server instance on which I will be deploying the LAPS binary. LAPS binaries come in the form of an MSI installer and can be downloaded from the Microsoft Download Center. You can install the LAPS binaries manually, with an automation service such as EC2 Run Command, or with your existing software deployment solution. While signed in to the AWS Management Console, choose EC2. In the Systems Manager Services section of the navigation pane, choose Run Command. Choose Run a command, and from the Command document list, choose AWS-InstallApplication. From Target instances, choose the instance on which you want to deploy the LAPS binaries. In my case, I will be selecting the instance tagged as Web Server. If you do not see any instances listed, make sure you have met the prerequisites for Amazon EC2 Systems Manager (SSM) by reviewing the Systems Manager Prerequisites. Leave the other options with the default values and choose Run. The AWS Management Console will return a Command ID, which will initially have a status of In Progress. It should take less than 5 minutes to download and install the binaries, after which the Command ID will update its status to Success. If the Command ID runs for more than 5 minutes or returns an error, it might indicate a problem with the installer. To troubleshoot, review the steps in Troubleshooting Systems Manager Run Command. To verify the binaries have been installed successfully, open Control Panel and review the recently installed applications in Programs and Features. You should see an entry for Local Administrator Password Solution with a version of 6.2.0.0 or newer. In the previous section, I used EC2 Run Command to install the LAPS binaries on an EC2 instance. Now, I am ready to extend the schema in an AWS Microsoft AD domain. Extending the schema is a requirement because LAPS relies on new AD attributes to store the password and its expiration time. In an on-premises AD environment, you would update the schema by running the Update-AdmPwdADSchema Windows PowerShell cmdlet with schema administrator credentials. Because AWS Microsoft AD is a managed service, I do not have permissions to update the schema directly. Instead, I will update the AD schema from the Directory Service console by importing an LDIF file. If you are unfamiliar with schema updates or LDIF files, see How to Move More Custom Applications to the AWS Cloud with AWS Directory Service. 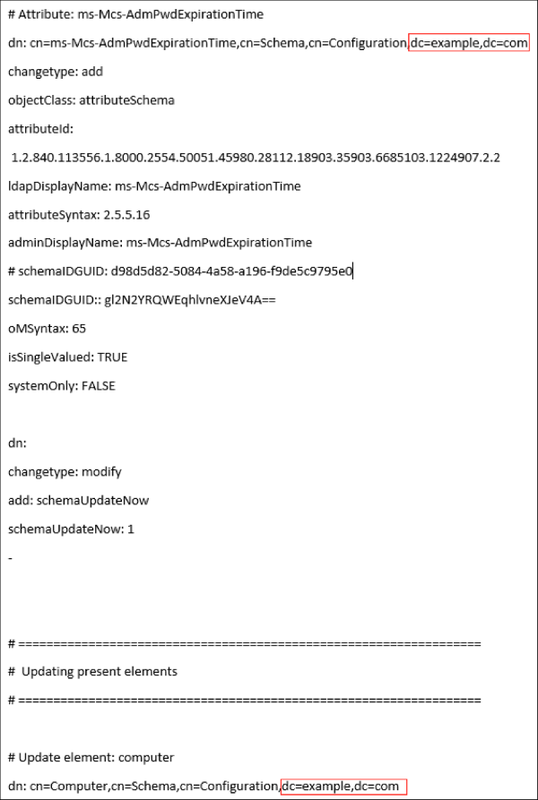 To make things easier for you, I am providing you with a sample LDIF file that contains the required AD schema changes. Using Notepad or a similar text editor, open the SchemaChanges-0517.ldif file and update the values of dc=example,dc=com with your own AWS Microsoft AD domain and suffix. On the Directory Service console, select from the list of directories in the Microsoft AD directory by choosing its identifier (it will look something like d-534373570ea). On the Directory details page, choose the Schema extensions tab and choose Upload and update schema. When prompted for the LDIF file that contains the changes, choose the sample LDIF file. In the background, the LDIF file is validated for errors and a backup of the directory is created for recovery purposes. Updating the schema might take a few minutes and the status will change to Updating Schema. When the process has completed, the status of Completed will be displayed, as shown in the following screenshot. When the process has completed, the status of Completed will be displayed, as shown in the following screenshot. If the LDIF file contains errors or the schema extension fails, the Directory Service console will generate an error code and additional debug information. To help troubleshoot error messages, see Schema Extension Errors. Create the ms-Mcs-AdmPwd attribute, which stores the password. Create the ms-Mcs-AdmPwdExpirationTime attribute, which stores the time of the password’s expiration. Add both attributes to the Computer class. In the previous section, I updated the AWS Microsoft AD schema with the required attributes for LAPS. I am now ready to configure the permissions for administrators to retrieve the password and for computer accounts to update their password attribute. As part of configuring AD permissions, I grant computers the ability to update their own password attribute and specify which security groups have permissions to retrieve the password from AD. As part of this process, I run Windows PowerShell cmdlets that are not installed by default on Windows Server. Note: To learn more about Windows PowerShell and the concept of a cmdlet (pronounced “command-let”), go to Getting Started with Windows PowerShell. Before getting started, I need to set up the required tools for LAPS on my Management instance, which must be joined to the AWS Microsoft AD domain. I will be using the same LAPS installer that I downloaded from the Microsoft LAPS website. In my Management instance, I have manually run the installer by clicking the LAPS.x64.msi file. On the Custom Setup page of the installer, under Management Tools, for each option I have selected Install on local hard drive. The fat client UI – A simple user interface for retrieving the password (I will use it at the end of this post). The Windows PowerShell module – Needed to run the commands in the next sections. 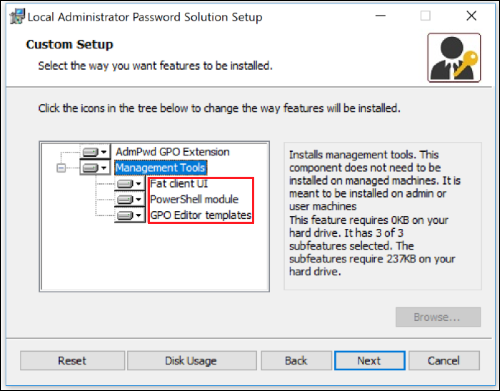 The GPO Editor templates – Used to configure Group Policy objects. The next step is to grant computers in the Computers OU the permission to update their own attributes. While connected to my Management instance, I go to the Start menu and type PowerShell. In the list of results, right-click Windows PowerShell and choose Run as administrator and then Yes when prompted by User Account Control. In the Windows PowerShell prompt, I type the following command. To grant the administrator group called Admins the permission to retrieve the computer password, I run the following command in the Windows PowerShell prompt I previously started. In the previous section, I deployed the LAPS management tools on my management instance, granted the computer accounts the permission to self-update their local administrator password attribute, and granted my Admins group permissions to retrieve the password. Note: The following section addresses the Group Policy Management Console and Group Policy objects. If you are unfamiliar with or wish to learn more about these concepts, go to Get Started Using the GPMC and Group Policy for Beginners. On my Management instance (i-03b2c5d5b1113c7ac), I have installed the Group Policy Management Console (GPMC) by running the following command in Windows PowerShell. Next, I have opened the GPMC and created a new Group Policy object (GPO) called LAPS GPO. In the Local Group Policy Editor, I navigate to Computer Configuration > Policies > Administrative Templates > LAPS. I have configured the settings using the values in the following table. Next, I need to link the GPO to an organizational unit (OU) in which my machine accounts sit. In your environment, I recommend testing the new settings on a test OU and then deploying the GPO to production OUs. Note: If you choose to create a new test organizational unit, you must create it in the OU that AWS Microsoft AD delegates to you to manage. For example, if your AWS Microsoft AD directory name were example.com, the test OU path would be example.com/example/Computers/Test. To test that LAPS works, I need to make sure the computer has received the new policy by forcing a Group Policy update. While connected to the Web Server instance (i-0b7563d0f89d3453a) using Remote Desktop, I open an elevated administrative command prompt and run the following command: gpupdate /force. I can check if the policy is applied by running the command: gpresult /r | findstr LAPS GPO, where LAPS GPO is the name of the GPO created in the second step. Back on my Management instance, I can then launch the LAPS interface from the Start menu and use it to retrieve the password (as shown in the following screenshot). Alternatively, I can run the Get-ADComputer Windows PowerShell cmdlet to retrieve the password. In this blog post, I demonstrated how you can deploy LAPS with an AWS Microsoft AD directory. I then showed how to install the LAPS binaries by using EC2 Run Command. Using the sample LDIF file I provided, I showed you how to extend the schema, which is a requirement because LAPS relies on new AD attributes to store the password and its expiration time. Finally, I showed how to complete the LAPS setup by configuring the necessary AD permissions and creating the GPO that starts the LAPS password change. If you have comments about this post, submit them in the “Comments” section below. If you have questions about or issues implementing this solution, please start a new thread on the Directory Service forum.